Brazil has 8.51 million km2 of territorial area and a tropical climate. In 2010, the occupation of the Brazilian soil consists of 20.8% pasture, 6.8% agriculture, 0.8% forested areas, 61.0% natural forests, and 9.7% other areas. In 2012, of the total area of the country 3.25% (27.65 million ha) is occupied by soy bean cultivation and 1% (8.5 million ha) by sugar cane cultivation. In 2012, the main cultivated species in the country were Eucalyptus spp. (71.0%), Pinus spp. (21.75%), Acacia mearnsii and Acacia mangium (2.12%), Hevea brasiliensis (2.36%), and Schizolobium amazonicum (1.22%). From 2004 to 2012, the planted forest area growth was 50.4%. The main factor that boosted this growth was the demand of the pulp and paper, followed by wood-based panels sector. It is also notable the development of new planted forests in Brazil for energy purposes. In recent decades, scientific and technological advance shave resulted in significant improvements in productivity, resistance to diseases, uniform degree of the forest plantations, wood quality etc. Among the most researched species are the ones belonging to Eucalyptus gender for having excellent adaptability to the edaphoclimatic conditions in the country. The current average productivity of Eucalyptus is of 40.7 m3/ha·year. In some regions of the country the average productivity of Eucalyptus has reached 100 m3/ha·year. The Brazilian forestry industry uses mainly planted forests, and the pulp and paper industry consumes only this type of wood. The pulp and wood panel sectors are more technologically advanced in relation to the other wood products sectors. Brazil has forest vocation sowing to its elevated territorial extension of 8.51 million km2  and edaphoclimatic conditions that are exceptionally adequate for forest cultures. Decades of scientific and technological development have resulted in elevated forest productivity and high uniformity and quality woods, especially in the clonal forests of Eucalyptus. The average productivity of Eucalyptus reached 40.7 m3/ha · year in 2012 . In some regions of the country, the average productivity of Eucalyptus reached 100 m3/ha · year . Of the total of planted forests in the country (7.2 million ha), 71.0% is of Eucalyptus . The Brazilian forest-based industry uses mainly planted forests of Eucalyptus, which is the main focus of this article. This paper discusses Brazilian planted forests, the program of wood quality, forestry legislation and forest-based industries, including the main sectors, and technology levels, as well as the market for Brazilian forest products. 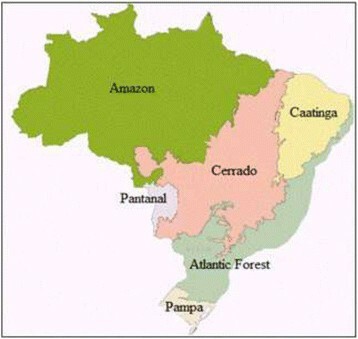 Brazil has 8.51 million km2 of territorial area, 9,198 km of coast line, a tropical climate, 49 already classified ecoregions, incalculable ecosystems, the largest river system in the world, and six continental biomes (Table 1 and Figure 1), namely (1) The Amazon: the climate is hot humid and the vegetation is characterized by closed forest with large trees; (2) ‘Cerrado’: the climate is seasonal tropical and the vegetation is characterized by the gnarled trunks, grasses, and shrubs; (3) Atlantic Forest: the climate is tropical humid and the vegetation is characterized by large and medium-sized trees forming a dense and thick forest; (4) ‘Caatinga’: the climate is semi-arid and the vegetation is characterized by a medium-sized shrub with twisted branches; (5) ‘Pampa’: the climate is subtropical with four well-defined seasons of the year and the vegetation is characterized by the presence of grasses, shrubs, and small trees; (6) ‘Pantanal’: the climate is continental tropical, with high temperatures and rainfall. The vegetation is characterized by grasses, medium-sized trees, creeping plants, and shrubs ,,. It is the country with the largest biodiversity on Earth, containing at least 70% of the world's plant and animal species ,,. In 2012, Brazil had 53.56% of its total area preserved (456 million ha), 77.55% of the Amazon, 28.15% of ‘Cerrado’, 18.13% of Atlantic Forest, 49.04% of ‘Caatinga’, 15.96% of ‘Pampa’ and 53.56% of the ‘Pantanal’ . Brazilian biomes [ ] . In 2010, the occupation of the Brazilian soil consisted of 20.8% (177 million ha) pasture, 6.8% (57 million ha) agricultural areas, 0.8% (6.8 million ha) planted forests, and 61.0% (519.2 million ha) natural forests . Of the total area of the country, 3.25% (27.65 million ha) is occupied by soybean cultivation and 1% (8.5 million ha) by sugar cane cultivation . In 2012, the area of natural forests preserved by companies of the forest sector corresponds to 2.1 million ha, under the form of Permanent Preservation Areas (PPAs), legal reserves (LR), and Private Reserves of the National Heritage (PRNHs) . In recent decades, with the implementation of natural resources preservation and conservation policies adopted by the Brazilian government, the Conservation Units (CU) went from 58,000 ha before 1970 to 61.8 million ha in 2011, where 45.5% is under full protection regimen and 54.5% is of sustainable use . The data from Table 2 indicate that Brazil has only 7.0 million of planted forests (0.8% of its total area), which is insignificant if compared to the areas of planted forests in China, 45.1 million ha, and of India, 32.6 million ha ,. The Brazilian planted forests are located mainly in the Southeast and South regions (72.3%). However, there has been alteration in the area of cultivation, with a significant increase in the states located in the new frontier of the sector, such as in the states of Tocantins (39.6%), Mato Grosso do Sul (18.4%), Pará (5.2%), and Piauí (5.2%), which showed the highest increase in 2012 compared to 2011 . Among the planted forest areas, 13.82% come from fomentation, 15.82% from third-party lands, and 73.57% from own lands. The Mato Grosso do Sul State stands out for presenting 62.3% of forest plantations in third-party lands . The composition of the Brazilian planted forests is shown in Table 3, where a dominance of Eucalyptus is observed. From 2004 to 2012, the growth was 50.4%. In 2012, areas of Eucalyptus and Pinus planted totaled 5,102,030 and 1,562,782 ha, respectively. Compared to 2011, the planted area of Eucalyptus grew about 4.70% and the one of Pinus decreased 4.82%. The main factor that boosted the planting growth of Eucalyptus was the establishment of new plantations to fulfill the future demand of industrial projects in the pulp and paper, followed by wood-based panels sector . It is also notable the development of new planted forests in Brazil for energy purposes . From the total area of Eucalyptus planted in Brazil, 5.5% is located in the North, 16.4% in the Northeast, 12.2% in the Midwest, 54.2% in the Southeast, and 11.8%in the South . From the total area of Pinus planted in Brazil, 0.8% is located in the North and the Northeast, 1.7% in the Midwest, 12.8% in the Southeast, and 84.7% in the South . In 2012, of the total of wood coming from planted forests (193.9 million m3), 67.4% was directed to industrial use, 28.3% to firewood, and 4.3% to charcoal production . The average productivity of Eucalyptus in Brazil reached 40 m3/ha · year in 2012 . In some regions of the country, the productivity of Eucalyptus spp. reached 100 m3/ha · year . In 1990, the average productivity of eucalyptus in Brazil was 26 m3/ha · year. It is anticipated that in 2025 the average productivity will reach values of the order of 56 m3/ha · year . The average productivity of the species Pinus, planted especially in the south of Brazil, is of the order of 41 m3/ha · year . This productivity used to be 23 m3/ha · year in 1990, and it should reach 42 m3/ha · year in 2025 . In recent decades, scientific and technological advances resulted in significant improvements in productivity, resistance to diseases, uniform degree of forest plantations, and wood quality, etc., especially in Eucalyptus, which has excellent adaptability to the country's edaphoclimatic conditions. Such advances allowed the wood to be segregated for specific purposes, because the technological characteristics of determined products were known. Through the use of classical forestry improvement tools, cloning, and genomics the production of custom wood to several industrial applications, such as carbonization, pulp and paper, panels, among others, has been possible. The Eucalyptus genome has already been sequenced, and the clone selection using genomic characteristics is in a phase of research that will enable a faster and more efficient selection, unlike the conventional selection, which uses phenotypic characteristics . The Brazilian forest code regulates the way the land should be explored, establishing where the natural vegetation should be kept and where there might be different types of rural production. The code in effect until may 2012 was from 1965 with several modifications through decrees, however still outdated and needing reforms. Owing to this, in 1999, the Bill 1876 was presented in order to replace the one from 1965 to suit the present reality of Brazil. Since then, a discussion about the forest code with the participation of several government institutions has been taking place in order to modify the text. In October 2012, the Law 12,797 establishing the new Brazilian forest code was approved with nine vetoes . The main alterations in the old Brazilian forest code are described in Table 4. The ‘ruralistas’ contend that the new code limits production and that areas already consolidated as productive, even though they are located by rivers, hillsides, or hilltops, should not be preserved. Meanwhile, scientists and environmentalists maintain that keeping these details in the new code will encourage new deforestation. The areas of legal reserve are kept as before, except in the states that have 50% or more areas preserved; in this case, the requirement of legal reserve is reduced up to half in relation to the old forest code. There is an exemption from the area of legal reserve for small properties. Areas of permanent preservation, such as river margins, hilltops, hillsides, etc., cannot be deforested. The Brazilian forestry industry includes pulp and paper (printing and writing, newsprint, packaging, cardboard, and tissue), industrialized wood panels (fibreboards: low-density fibreboard (LDF), medium-density fibreboard (MDF), high-density fibreboard (HDF) and hardboard; plyboard: conventional and laminated veneer lumber (LVL); agglomerate: conventional and medium-density particleboard (MDP), and oriented-strand board (OSB)), sawn wood (vigas, boards, wood structural), value-added wood products (VAWP) (doors, windows, furniture, etc. ), treated wood (stakes, light poles, cross arms, pillars, fences, and ties), steel to charcoal (pig iron, iron alloy, and steel), and energy (industrial wood, biomass, and pellets) ,,. The forest-based Brazilian industry consists of 222 pulp and paper companies, 17 fibre plates companies, 20 pellets companies, and around 10,000 sawmills, 300 rolling and plyboard factories, 450 units of wood drying, 48,000 furniture formal companies, and 300 wood preservation companies, in addition to small-scale companies that produce chips, excelsior, briquettes, light poles, poles, and small wooden objects ,,. The main industrial poles are concentrated in the south and southeast regions, where the regional and logistic aspects favor the generation of scale economy favoring competitiveness. The Brazilian forest products industry uses mainly the planted forests, and the pulp and paper industry uses only this type of wood. In 2012, from the wood coming from planted forests (182.4 million m3), the use by the industries was 35.2% for pulp and paper, 24.5% for industrial wood, 12.7% for charcoal production (pigiron), 16.4% for sawn, 7.1% for industrialized wood panels, 2.7% for plyboard, 0.9% for treated wood, and 0.6% for other uses ,. From 2011 to 2012, the wood consumption for Eucalyptus in logs increased by 11.1%. The consumption of Pinus logs decreased 4.4% during this same period . The main consumer of wood from natural forests is the energy sector. In 2011, the production of charcoal was 4,951,207 tons, from which 69.5% was produced from planted forest and 30.4% from natural forests. The biggest relative participation of woods originating from natural forests is in the production of fire wood for industrial use, which uses 43.8% of the native forests commercially exploited . In general, the modernity of the technological park, combined with quality and the low cost of raw material, are the main factors that boost the Brazilian sector. The Brazilian pulp industry is of elevated size and high capital. To guarantee competitiveness in the market, the minimum production of a pulp mill should be superior to 1,200,000 tons per year (Figure 2). Evolution of pulp mills specific investment and productive capacity in the last two decades [ ] . The tendency in the sector has been to increase productive capacity, through mergers and expansion, besides new factories with elevated productive capacity (Table 5). The pulp factories use mainly continuous digesters, with high-temperature rinsing as well as modified kraft pulping processes, including compact and lo-solids. The bleaching technologies used are elemental chlorine free (ECF), elemental light free (ECF), and totally chlorine free (TCF), including pre-delignification with oxygen, bleaching stages with chloride dioxide, hydrogen peroxide, and ozone. The environmental pollution is strongly controlled by specific legislation, which has led to high investments in environmental control. The pulp and paper industry is a large consumer of steam and electric energy but the new non-integrated pulp factories produce surplus energy of 30% to 40%. Brazil is among the most advanced reconstituted wood panel manufacturers in the world. It has the largest number of state-of-the-art factories . With continuous investments in technology and automation, the companies use technologically the existent factories, install new unities, implant continuous production lines, and modernize the finishing process. 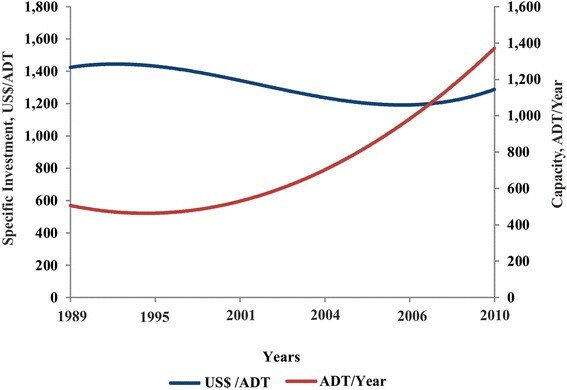 In recent years, MDF has lost market share to MDP; for this reason, in Brazil, there has been adaptation of agglomerate lines for the production of MDP, which includes continuous press and more silos for particles separation, among others. The industrial areas adopt an environmental management system that allows performance monitoring of the effluent treatment and in the correct destination of solid residues, as well as actions aiming to reduce atmospheric emissions and decrease electric energy consumption . The sector of plyboard in Brazil is formed mainly by several small companies with relatively small capital investment of around US$ 175,000.00 and low technological levels. There is an elevated number of sawmills in Brazil, close to 10,000, and the majority is small, with low levels of technology and environmental control. In larger-scale sawmills with bigger size optical scanners or laser for control and classification of logs, as well as determination of the best log position for the log sawing, slash saw or band saw are used. The transport of logs and wooden pieces is mechanized among the several stages . In 2010, the Brazilian pig iron and steel companies used 24.81% charcoal and 75.19% coal for the reduction of iron ore .
Brazil is the world's largest producer of charcoal for reduction of iron ore into pig iron. In 2010, 35% of the pig iron produced in Brazil was produced through reduction with charcoal. The advantage of iron ore reduction with charcoal, in relation to coal, is the low level of impurities, resulting in improvements in the quality and price of final product. In 2010, the price of coal was 19% higher than the price of charcoal. The charcoal had always had its price smaller than the price of coal; however, this trend has been altered by the reduction of the usage of natural forests, wood shortages, and the necessity to have a forest base for the charcoal production . About 10% of the total charcoal production in Brazil comes from companies that use high-technology rectangular kilns, and 90% from small and medium owners who use traditional kilns. The rectangular kilns are mechanized, have a combustion chamber for gas burn, the possibility of tar recovery, steam injectors, a heat exchanger to accelerate the cooling process, etc. To be economically viable, the rectangular kilns should produce at least 5,000 m3 of charcoal per month. The cost of installation of each kiln varies from US$ 0.1 to 0.25 million. There are kilns with the capacity to process up to 500 m3 of wood per cycle of pyrolysis, with a wood conversion yield into charcoal of 30% to 35% . The traditional kilns (surface, low-coast, hillsides) are of low yield (27%), without carbonization temperature control, and are high polluters of the atmosphere . The Forest Production Gross Value (FPGV) refers to the turnover of each industry segment. In 2012, the FPGV of planted forests was US$ 28.2 billion, which means 4.6% bigger than observed in 2011 . The pulp and paper sector contributed 53.7% (Table 6), the furniture sector contributed 20.3%, and the industrialized wood panels contributed 11.6% of this value . In 2000, Brazil was the world's seventh largest pulp producer, surpassed only by the United States, Canada, China, Japan, Finland, and Sweden. Currently, the country is the world's fourth largest pulp producer and the first producer and exporter of short fibre pulp in the market. From 2002 to 2012, national pulp production increased 57%. In 2012, pulp production totaled 13.896 million tons and exports 8.513 million, values a little inferior to the ones from 2011, which were 13.922 million and 8.478 million tons, respectively. However, the results were considered positive, given the current national and international scenarios. From the total produced pulp, 85.1% is of hardwood (HWD) bleached kraft, 11.7% of softwood (SWD) brown kraft, and 3.1% of HWD/SWD high-yield pulp . With investments of US$ 12 billion in the last decade (2011) and new investments announced until the end of this decade (Table 5), the capacity of Brazilian production will reach around 25 million tons per year and Brazil will be the fourth to third highest producer . Regarding paper, Brazil is the world's ninth largest producer with 10.182 million tons in 2012. In the period between 2000 and 2012, the paper industry increased an average of 2.5% per year owing to increased domestic and external demand . In 2000, Brazil was the ninth largest producer of sawn wood in the world, it is currently the 11th largest producer, with production of 9.2 millions m3 per year, from which 8.3 million m3 are for domestic consumption. In the period between 2000 and 2012, the sawn wood production increased 12.04%, while the exports decreased 37.33%. The domestic market is responsible for the increase in production, especially due to the packaging and construction sectors . The increase in plywood production, in the period between 2002 and 2012, was 0.5 million m3, which represented an average increase of 2.8% per year, while the consumption increased 0.6 million m3 annually. In 2012, the production and consumption of plywood were 2.1 and 1.1 million m3, respectively, which represented an increase of 16.7% in production and 10% in consumption compared to 2011 . From 2000 to 2012, the production and consumption of wood industrialized panels (MDP, MDF, OSB, and fibreboard) increased 8.9% and 9.9% per year, respectively, the biggest annual increase among the Brazilian forest products. However, in 2012, 7.3 and 6.5 million m3 wooden panels were produced and consumed, respectively, which represents an increase of 12.3% in production and 10.8% in consumption compared to 2011 . New projects have been confirmed until the end of 2013, resulting in an increase of 1.940 million m3 in MDF production and 700 thousand m3 in MDP production . This growth is explained by the increasing expansion of the consumer market in Brazil, due to the good performance of the construction, furniture, and packaging sectors . The domestic market is the main consumer of charcoal, used by steel mills for pig iron and ferroalloys production. Although the steel mill sector has not recovered from 2008 crisis, the production of wood charcoal from planted forests increased 61.4% in the period between 2009 and 2012, due to environmental pressures for elimination of charcoal use from native areas in steel mill . Except for firewood, wood charcoal, sawn wood, and wood industrialized panels that are destined mainly for the domestic market, the other products are destined mainly for the external market. For instance, 60.5% of pulp and 47.1% of plywood are exported. These demonstrate the importance of exportations for the forest Brazilian sector. The main importers of Brazilian forest products are Argentina (paper), Germany (plywood), China (pulp), and United States (panels and sawn wood) . Exports of forest products in 2012 totaled US$ 7.5 billion and imports US$ 5.5 billion. Thus, the trade balance for the forest sector was US$ 5.5 billion. In addition, it is responsible for R$ 7.6 billion (0.5% of national revenue) of the tributes and generating 4.3 to 5.0 million of direct and indirect jobs . However, the Brazilian forest sector has weak participation in the world exports of forest products, with only 2% of the total in 2011 (Table 7). The competitiveness of the forest industrial sector, which historically was elevated in the international market, owing mainly to high forest productivity in Brazil and the low costs of the wood delivered, has been decreasing. At the beginning of the decade, Brazil was the country with the lowest production cost of wood; it is currently the fourth after Russia, Indonesia, and the United States. The reasons are the disproportionate unexpected increase of domestic costs in relation to other international competitors, caused by currency appreciation, increase of salaries and social charges, high cost of electric energy, mainly in the sector of mechanically processed wood, high tax burden, deficient infrastructure with consequent increase in the logistic cost, and restrictions to acquisition of land by national companies with majority of foreign capital . Brazil has forestry vocation owing to its elevated territorial extension, edaphoclimatic conditions exceptionally adequate for forestry cultures, and the knowledge developed in forestry production technologies. However, this potential is not adequately explored, because only 0.8% of its territory is occupied with planted forests. The great differential of the Brazilian forest industrial sector is the wood, produced at low costs and with elevated quality in the country, especially Eucalyptus, which in some areas can reach a productivity of up to 100 m3/ha · year. Among the sectors of the Brazilian forest industry, the pulp and paper are highlighted, being responsible for 53.7% of the FPGV. The country is the world's fourth largest pulp producer and the first producer and exporter of short fibre pulp in the market. The biggest annual growth (8.9%) among the Brazilian forest products in the last decade was the industrialized panels (MDP, MDF, OSB, and fibreboard) due to good performance of construction, furniture, and package sectors. The firewood, wood charcoal, sawn wood, and wood industrialized panels are destined mainly for the domestic market, while the other products are destined mainly for the external market, which demonstrates the importance of exportations for the forest Brazilian sector. The world competitiveness of the Brazilian forest industrial sector, which historically was elevated, has been decreasing, owing mainly to the overvaluation, high tax burden, high logistics cost, and restrictions to land acquisition by foreigners. Development of specific public policies for the sector are necessary for the country to take comparative advantage in order to strengthen its international competitiveness so that this forestry vocation is fully exploited and contributes in a significant way to the economic and social development of the country. The authors’ contributed equally to this review and all authors read and approved the final manuscript.